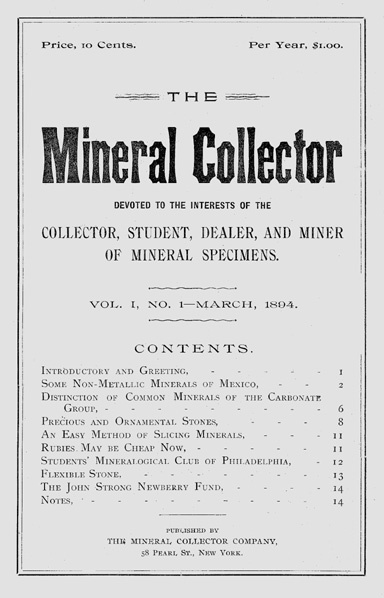 Privately published index to the Mineral Collector magazine, published 1894 to 1909. This new index is four separate indexes in one volume: general subject-title index, authors index, chronological index and illustration index to over 1900 articles and 204 illustrations in the fifteen annual volumes. Now for the first time locating articles is easy and fast. 8-1/2 x 11". 95 pages. $25 (plus $4 shipping). To purchase your copy of this unique publication click on this link to go to the Online order form. Analysis of Kunzite by Davis, R. O. E.
TheArt of Collecting (With Notes on Localities) by Pennypacker, Charles H.
Art of Lapidaries by Kunz, George F.
Benitoite and Neptunite by Wilke, R. M.
Beryl Mountain (South Acworth, New Hampshire) by Allen, C. A. The Birdsboro Trap-Rock Quarries (near Reading, Pennsylvania) by Groth. E. A. Blue Quartz of Bucks County, Pennsylvania by Vanartsdalen, John F.
Bohemian Garnets (Northwest of Prague) by Kunz, George F.
Boleite and Cumengite by Foote, Dr. A. E.
Chondrodite on New York Island by Edwards, Arthur, M. M.D. Collecting Notes in the Northeast by Pennypacker, Charles H.
A Collector's Paradise (St. Lawrence County, New York) by Valiant, W. S.
A Crystal Picnic (Collecting at Table Mountain, Colorado) by Cross, Rev. R. T.
Deserted Emery Mines of Massachusetts by Cobb, L. F.
Directory of Mineral Localities in and Around Philadelphia by Benge, ElmerWherry, Edgar T.
The Elements as Minerals in the Bement Collection by Gratacap, Louis P.
TheEmery Mines at Chester, Massachusetts by Graban, A. W.
The F. H. Canfield Collection by Bates, Albert C.
A Few Pointers (on Minerals from New Jersey) by Valiant, W. S.
Garnets (With Notes on Occurrences) by Pennypacker, Charles H.
Garnets Dug Up In Subway, 33rd Street and Sixth Ave.
Gem Cutting in America (From the Mineral Resources of the United States) by Kunz, George F.
Gem Fields of the World by Kunz, George F.
Gem Tourmalines of the United States by Gardiner, C. R.
Gems of Quartz Origin by Kunz, George F.
A General Description of Cumberland County (Pennsylvania) by Groth, E. A. The Geological Formations of Chenango County, New York (Fossils) by Davis, E. E.
George Letchworth English by Bates, Albert C.
Great Opals of the World by Kunz, George F.
How Gems Change Color by Kunz, George F.
Hunting For Crystals in Northern New York by Cross, Rev. R. T.
Hunting For Minerals In New Hampshire by Rand, J. C.
Kunzite, A New Lilac-Colored Transparent Spodumene by Kunz, George F.
Memoirs of the Late Artis H. Ehrman by Ashby, George E.
TheMineral Business by Gratacap, L. P.
Mineralogical Notes (on New Jersey Minerals) by Valiant, W. S.
TheMineralogist and Geologist Around Boston, Massachusetts by Rand, John C.
TheMinerals of Fairmount Park, Philadelphia, Pennsylvania by Groth, E. A.
TheMinerals of Haddam, Connecticut by Davis, James W.
TheMinerals of Haddam, Connecticut - Part II by Davis, James W.
TheMinerals of Iceland by Gratacap, L. P.
TheMinerals of Maine by Chadbourn, E. R.
Minerals of Massachusetts (Boston Vicinity) by Rand, J. C.
Minerals of Southern Bucks County, Pennsylvania by Vanartsdalen, John F.
Mines, New and Old - Collecting Around the United States by Bates, Albert C.
Mount Apatite (Maine) by Waterman, Charles E.
Mt. Mica in 1893 by Hamlin, A. C.
New Jersey Mineral Localities by Valiant, W. S.
A New Locality for Spear Pyrites (at Bonhamtown, New Jersey) by Manley, John A. Notes on Some Mineral Localities near Boston, Massachusetts by Rand, J. C.
An Old Mining Region (Ellenville, New York) by Valiant, W. S.
Old Times and New localities by Valiant, W. S.
On The Formation of Hematite on Staten Island, NY by Edwards, Arthur, M. M.D. AOnce Noted Prehnite Locality Near Farmington, Connecticut by Stillwell, Harry W.
Output of the Mt. Mica Mine During 1898 by Hamlin, A. C.
ThePectolites of New Jersey by Bates, Albert C.
ThePennsylvania Locals by Pennypacker, Chas. H.
The Perkiomen Copper Mines by Tomlinson, W. H.
Philadelphia Quartz by Lewis, T. J.
Phoenixville Quartz by Groth, E. A. A Procession of Locality (Phoenixville, Pennsylvania) by Pennypacker, Charles H.
Quartz Crystals at Brookline, Massachusetts by Rand, J. C.
Recent New York City Finds - Letter to the Editor by Miller, F. W.
A Reconnaissance of Jenny Jump Mountain by Valiant, W. S.
A Remarkable Mineral Locality (Hoxie's Quarry, Paterson, NJ.) by Ehrman, A. H.
A Remarkable Mineral Region (near West Chester, Pennsylvania) by Groff, Dr. G. C.
A Remarkable Pectolite by Grenzig, J. A. Jr.
A Remarkable Tourmaline Deposit, Rumford Falls, Maine by Webb, Harry G.
The Roundabout Collector in New England by Rand, J. C.
Rubellite in California by Wright, W. G.
Rutgers College Geological Museum, New Brunswick, New Jersey by Valiant, W. S.
Rutile Mining in Virginia by Merrill, George P.
Snake Hill Copper Mine (New Jersey) by George, W. A. Some Minerals Occurring at Worcester, Massachusetts by Rand, J. C.
Some Minerals Recently Found At Milton, Massachusetts by Rand, J. C.
The Story of the First Pennsylvania Copper Mine (Perkiomen) by Geist, George W.
OnThe Atomic Weight of Radium by Curie, Mme. The Collection of Minerals in the American Museum of Natural History and Bement Collection by Gratacap, Louis P.
The Tourmaline Mine at Haddam Neck, Connecticut (Gillette Quarry) by Martin, Daniel S.
A Trip After Meteorites - A Letter to Bement by Ward, Henry A. A Trip To Franklin Furnace, New Jersey by Manley, John A. A Trip to Cumberland, Rhode Island by Baker, J. W.
A Trip to New England by Pennypacker, Charles H.
Turquoise Mines of New Mexico by Cowan, John F.
The Unique Properties of Kunzite by Baskerville, Prof. CharlesKunz, George F.
Vacation Rambles in New York and Pennsylvania by Goodwin, H. R.
Valuable Finds in Western Massachusetts (Beryls at Blandford) by Herrick, R. L.
A Visit to the Friedensville Zinc Mines (Pa.) by Borden, Mr.
A Visit to the Roxbury, Connecticut Garnet Mines by Lane, R. M.
The W. W. Jefferis Collection by Pennypacker, Chas. H.
Wilson's Quarry (New Jersey) by F. P.
Wilson's Quarry, Plainfield, New Jersey by Hawkins, Alfred C.
Unfortunately, I cannot provide copies of articles. If you don't have a set, and cannot afford one, I suggest you visit your local library.